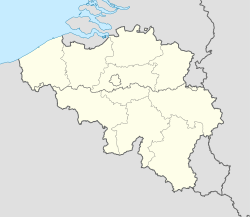 Stavelot (German: Stablo, Walloon: Ståvleu) is a Walloon municipality in the Belgian province of Liège. In 2006, Stavelot had a population of 6,671 and an area of 85.07 km2 (32.85 sq mi), giving a population density of 78 inhabitants per square kilometre (200/sq mi). The town grew up around the Abbey of Stavelot, founded ca 650, out of what had been a villa, by Saint Remaclus (Saint Remacle). The villa's lands occupied the borderland between the bishoprics of Cologne and Tongeren. The Abbey of Stavelot was secularized and demolished at the time of the French Revolution: of the church just the west end doorway remains, as a free-standing tower. Two cloisters — one secular, one for the monks — survive as the courtyards of the brick-and-stone 17th-century domestic ranges, now housing the Museum of the Principality of Stavelot-Malmedy, and museums devoted to the poet Guillaume Apollinaire, who was a long-term resident, and to the Circuit de Spa-Francorchamps. The foundations of the abbey church are presented as a footprint, with walls and column bases that enable the visitor to visualize the scale of the Romanesque abbey. Abbot Wibald (ruled 1130–58) was one of the greatest patrons of the arts in the 12th century; the Stavelot Triptych of gilded copper and enamels, which contained two fragments of the True Cross, was produced for the Abbey during his rule (about 1156). The binding of the Stavelot Bible, and the remaining fragments from the retable (altar screen) at Stavelot are also high points of medieval art. The town's coat of arms, granted in 1819, is parted fesswise between Stavelot's founding bishop, and the wolf which in Stavelot's founding legend carried bricks for the building of the Abbey. During the Battle of the Bulge in World War II, the city was the scene of severe fighting. From December 18–20, 1944, soldiers belonging to Sixth Panzer Army's Kampfgruppe Peiper armored battle group murdered more than 100 civilians, including women and children, as well as American prisoners of war, in Stavelot and the surrounding area. Peiper and some of his officers were after the war tried and convicted for this war crime along with others perpetrated during the same period. Stavelot is home to the Circuit de Spa-Francorchamps, the famous venue of the Formula One Belgian Grand Prix and the Spa 24 Hours endurance race. Stavelot also has a traditional carnival, the Laetare des Blancs-Moussis. On Laetare Sunday, the fourth Sunday of Lent, some 200 local men clad in white and masked with long red noses — the Blancs-Moussis — parade through town throwing confetti and beating bystanders with dried pig bladders. Stavelot has an oceanic climate influenced by its high elevation and inland position towards a more continental type by Belgian standards. Being located at a lower elevation than neighbouring village Malmedy at the other end of the original layout of the Spa-Francorchamps race track, Stavelot is slightly milder, drier and sunnier than Malmedy year round. Wikimedia Commons has media related to Stavelot.